By Dr. Robert R. Owens, Ph.D. Ever since the Supreme Court took unto itself the power to void laws passed by the representatives of the people in Marbury V. Madison the black-robed Justices have acted, and Americans have accepted them as if they are the source and the summit of what is and what isn’t allowed in America. In most cases since the middle of the 20th century, the high court has sided with whatever the central government wanted to do in the way of extending its power and curtailing rights which any person who can read plainly sees protected in the document they are sworn to defend. The “Necessary and Proper Clause” which is found in Article I, Section 8, Clause 18 states, “To make all Laws which shall be necessary and proper for carrying into Execution the [enumerated] Powers, and all other Powers vested by this Constitution in the Government of the United States, or in any Department or Officer thereof.” This is also known as the “Elastic Clause” because Congress and Presidents have stretched it to give them powers the Founders never would have dreamed possible outside a tyranny. The “Commerce Clause” found in Article I, Section 8, Clause 3 states, “to regulate Commerce with foreign Nations, and among several States, and with the Indian Tribes.” This is the go-to clause for the Progressive’s conquest of America. This is the clause that was used in the 1930s by FDR to implement most of the New Deal. It was used by LBJ in the 1960s to impose the Great Society. And it is being used by BHO in the 21st century to shackle us with the social democracy brand of socialism which has devastated Europe and which has been repudiated by our former adversaries in the Cold War. In the Supreme Court decision Wickard v. Filburn in 1942 it was handed down from on high that wheat farmer growing wheat on his own property for his own use can be legally regulated under the commerce clause because not selling your wheat and using it yourself is actually competing with wheat that is sold and is therefore commerce. This is the same clause the Obama Administration originally used as a defense to say they can fine people for not buying insurance arguing that not buying insurance is commerce. 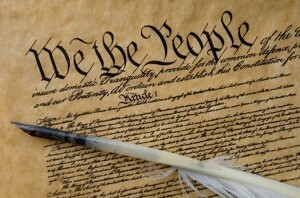 Yes, these two clauses have been stretched and interpreted beyond any semblance of rationality to restrict and restrain Americans in the enjoyment of the freedom and liberty which should be our birthright, yet the clause which clearly states that Congress has the power to reign in the Court has been ignored. Forget all the posturing about abortion by all the so-called conservatives in Congress. Has there ever been a concerted, protracted or sustained effort to remove abortion from the jurisdiction of the Supreme Court? No there hasn’t. And yet tomorrow, or even today Congress could pass a law stating that abortion is an exception to the court’s jurisdiction and with the signing of this law by the president Roe V. Wade would be null and void, and all state laws affecting abortion would once again be in effect.